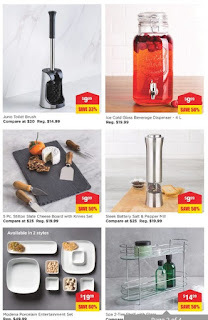 Kitchen stuff plus Canada October 23 - 29, 2017. 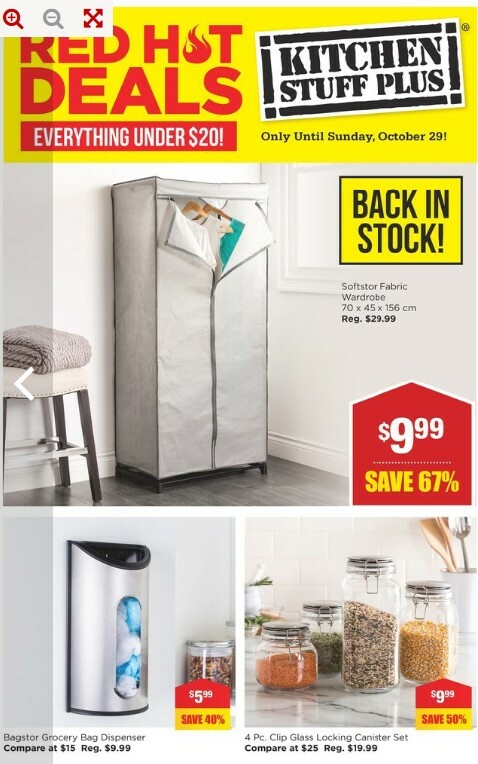 Shop for Softstor Fabric Wardrobe 70 x 45 x 456 Cm $29.99 Regular - Price Price $9.99 67% Savings. 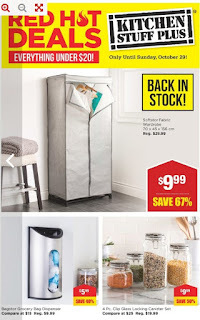 Bagstor Grocery Bag Dispenser $9.99 Reg. Price - Price $5.99 40% Savings Compare at $15.00. Clip Glass Locking Canister Set $19.99 Reg. Price - Price $9.99 50% Savings Compare at $25.00. 4 Pc. Juno Toilet Brush $14.99 Reg. Price - Price $9.99 33% Savings Compare at $20.00. Ice Cold Glass Beverage Dispenser $19.99 Reg. Price - Price $9.99 50% Savings 4 L.
Stilton Slate Cheese Board With Knives Set $19.99 Reg. Price - Price $9.99 50% Savings Compare at $25.00. 5- pc. Sleek Battery Slat & Pepper Mill $19.99 Reg. Price - Price $9.99 50% Savings Compare at $25.00. Mondena Porcelain Entertainment Set $49.99 Reg. Price - Price $19.99 60% Savings Available in 2 styles. Spa 2-Tier Shelf With Glass $29.99 Reg. Price - Price $14.99 50% Savings Compare at $30.00. Starfrit Glass Digital Nutrition Scale $39.99 Reg. Price - Price $19.99 50% Savings Compare at $50.00. onza Metal Coat Rack $39.99 Reg. Price - Price $19.99 50% Savings Compare at $50.00. Aurora Porcelain Platter Set $24.99 Reg. Price - Price $12.49 50% Savings 3 Pc. Smart Home Automatic Soap Dispenser $29.99 Reg. Price - Price $17.99 40% Savings Compare at $40.00. Starfrit Balance Glass Digital Body $39.99 Reg. Price - Price $19.99 50% Savings Compare at $50.00. Clip It Glass Storage Container Set $29.99 Reg. 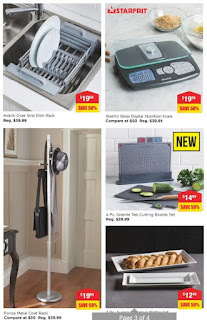 Price - Price $14.99 50% Savings 12 PC. Compare at $40.00. 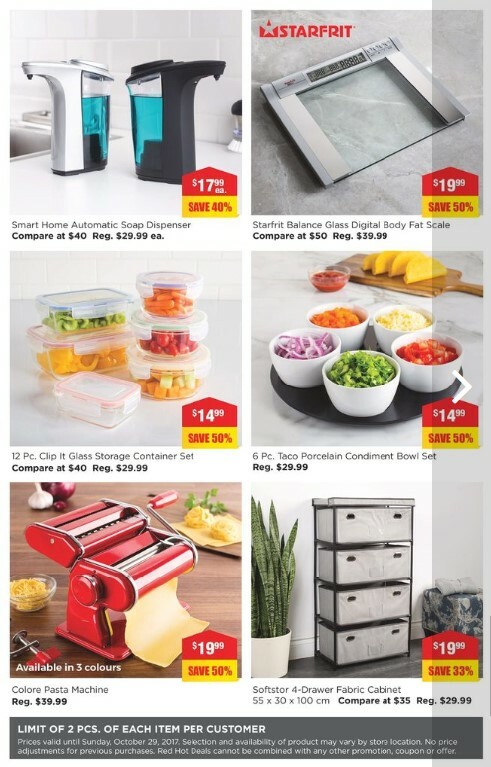 Find Kitchen stuff plus Canada valid October 23 - 29, 2017 such as Taco Porcelain Condiment Bowl Set $29.99 Reg. 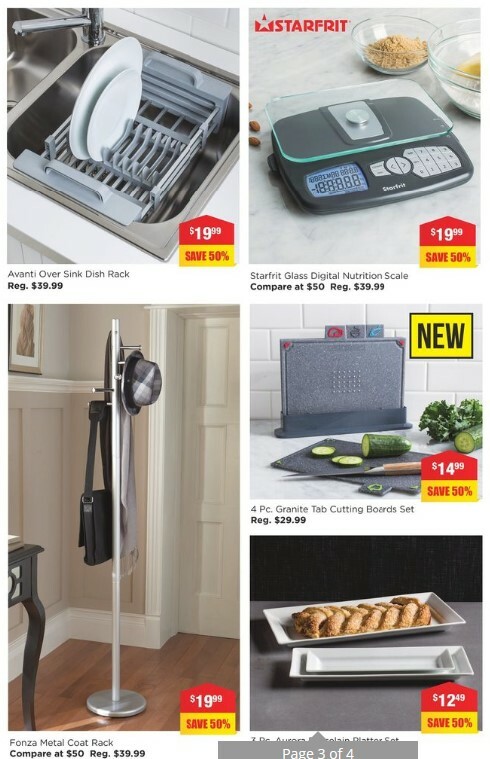 Price - Price $14.99 50% Savings 6 pc. 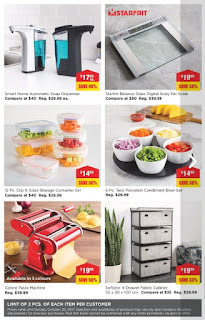 Colore Pasta Machine $39.99 Reg. Price - Price $19.99 50% Savings Available in 3 colours. Softstor 4-Drawer Fabric Cabinet $29.99 Reg. Price - Price $19.99 33% Savings 55 x 30 x 100 cm. Compare at $35.00.